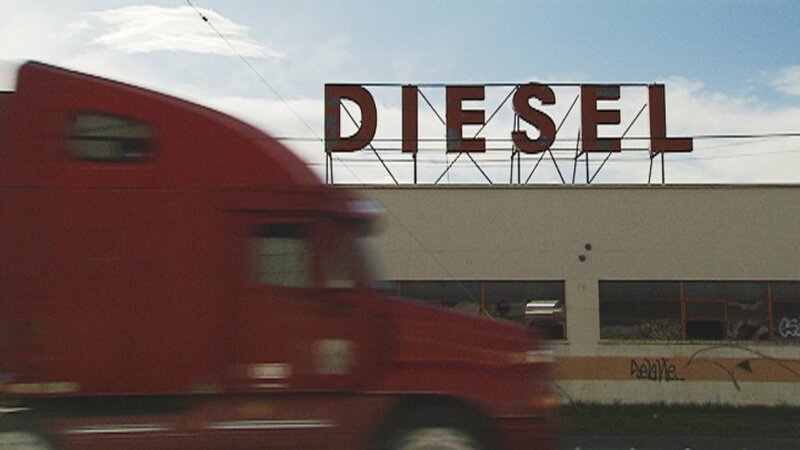 A proposal to reduce the climate-harming effects of Washington's largest contributor to global warming -- truck and car fuels -- is among the major climate legislation expected to pass soon. Democratic lawmakers are finding success in moving a raft of clean-energy bills through the Washington Legislature this session, benefiting from the seats they picked up in 2018 and using a new strategy to attract support by moderates in their own party. The sweeping bills would make Washington the fourth state to require a phaseout of fossil-fueled electricity; mandate energy overhauls for larger, old buildings; and join California, Oregon and British Columbia in reducing the climate-harming effects of car and truck fuels. The fate of three lesser bills to protect the climate is less certain, as lawmakers hurtle toward their scheduled April 28 adjournment. Those would promote the use of electric vehicles, crack down on climate-harming refrigeration gasses and require more energy-efficient electrical appliances. Passage of the bills, which Democrats tout as ways to reduce planet-heating greenhouse gas emissions, will burnish the climate-change bona fides of both legislators and Gov. Jay Inslee, who is making the fight against climate change the cornerstone of his 2020 presidential bid. Inslee is certain to sign the bills if they pass. He previously was repeatedly rebuffed in his climate-protection efforts by both the Legislature and Washington voters. “I will make defeating climate change the No. 1 priority of the United States,” Washington Gov. 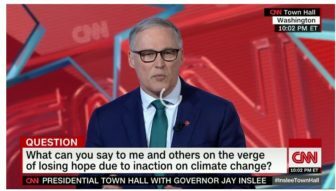 Jay Inslee said during his CNN Town Hall appearance on April 10. Back home in Washington State, Democratic lawmakers are finding success in moving a raft of clean-energy bills through the Legislature, though the fate of three lesser bills to protect the climate is less certain. The bill to make Washington’s electricity climate-friendly, SB5116, lays out a plan for making all electricity generation in Washington state carbon-emission neutral by 2030, meaning any greenhouse gas emissions will have to be offset by taking climate friendly steps such as building electric-vehicle charging stations. A utility also could comply by purchasing renewable-energy credits on the open market. By 2045, electricity generation would have to be completely carbon-emission free. That’s easier for Washington than for many other states because carbon-free hydropower already provides almost three-quarters of the state’s electricity. 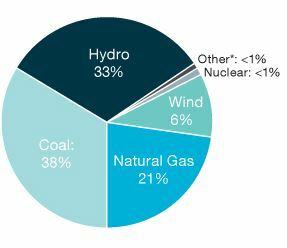 But coal and natural gas, which involve carbon emissions, together provide one-sixth of the state’s power. The legislation also bans sale of coal-powered juice to retail electricity consumers by 2026. California, Hawaii and New Mexico have previously passed legislation to phase out electricity from fossil fuels. The legislation passed the Senate on a party-line vote of 28-19. Last week it passed the House on a largely party-line vote of 56-42. Republicans sought unsuccessfully to replace the measure with one focused on fighting forest fires. Because House members amended the Senate bill, it will go back to the Senate for a second vote, which could happen as soon as this week. “There’s a lot of work ahead, but we’re optimistic,” said Clifford Traisman, an environmental lobbyist who represents both Washington Conservation Voters and Washington Environmental Council. The second major piece in Democrats’ package of climate legislation is a green buildings bill that sets “an efficiency performance standard” for commercial buildings of more than 50,000 square feet. That standard would apply to existing buildings and, in some cases, require retrofits. Rep. Beth Doglio, D-Olympia, the lead sponsor of the bill, said her proposal makes the retrofits less financially painful by offering compensation. The bill calls for public utilities to offer tax credits for owners of older buildings who would need to make a “significant investment” to comply, Doglio said. She said that buildings now under construction, as well as those put up in the last 20 years, will meet the standards laid out in the bill, HB1257, which came from Inslee’s office. In addition, HB1257 requires gas utilities to undertake efficiency programs for customers, “which creates a parity with the large electric utilities in the state,” Doglio said. It also demands that new construction with parking makes 10 percent of the parking spaces for electric vehicle recharging. Although the legislation’s prospects are good, it still needs to pass the Senate and then be re-approved by the House with Senate changes intact. A third spoke in the Democrats’ climate-change wheel, a clean-fuels bill sponsored by Rep. Joe Fitzgibbon, D-Seattle, is currently stuck in the Senate Transportation Committee. The legislation, HB1110, which establishes a low-carbon fuel standard, passed out of the House with 53 yeas and 43 nays, with two House members excused. Fuel makers and distributors whose product does not meet fuel-blend standards could buy credits from fuel makers whose products do — with credits calculated to reflect the life-cycle carbon content or intensity of the fuels. Traisman said the biofuels bill has been a tougher sell among lawmakers. “The fossil fuel industry has done a good job making that seem like somehow it’s going to create a huge increase at the price pump, even though the evidence is to the contrary in our neighboring states, and so, we have had more to overcome on that one,” he said. The increase in the number of Democratic-held Senate seats allowed the Democrats to push these pieces of legislation, since they were no longer held back by less liberal Democrats from rural and industrial districts. Even this year, there was opposition to the clean-fuels bill not only Republican representatives, but also from Democratic from Reps. Brian Blake of Aberdeen, Sharon Shewmake of Bellingham and Larry Springer of Kirkland. What’s more, Inslee and fellow Democrats went with a new political tack in this legislative session. Rather than try to put in place a carbon tax, as they did with two failed statewide ballot measures and unsuccessful legislation spearheaded by Fitzgibbon in last year’s session, they chose a piecemeal approach. By focusing separately on building, electricity sources and the transportation sector, they used a divide-and-conquer approach, preventing lobbyists for various carbon-intensive industries from joining forces against a standalone carbon-tax or cap-and-trade bill. “We shifted this year to a strategy that was going to reduce emissions in a sector-by-sector approach, and that’s what you’re seeing before you,” Traisman said. Opposition to the Democrats’ climate trifecta comes mostly from Republican lawmakers, whose views of the Democratic clean energy bills ranges from hostile to skeptical. “It doesn’t reduce carbon” anytime soon, said Rep. Richard DeBolt, R-Chehalis, who sought to change the clean-grid bill into a measure about forest fires. He criticized SB5116 for being ineffectual. Rep. Richard DeBolt, R-Chehalis, who sought to change the clean-grid bill into a measure about forest fires, criticized SB5116 for being ineffectual. “It doesn’t reduce carbon” anytime soon, he said. “I felt like our bill reduced carbon now,” he said, explaining that fighting forest fires next year would be a nearer-term goal. In an apparent reference to Inslee, DeBolt also said “outside pressures” forced the Democrats to end negotiations on SB5116, the farthest-reaching of the bills. “There’s other people in the building that want to be able to point to this bill, and it had to move quickly,” he said. Traisman dismissed the Republican assertion that Democratic lawmakers have been introducing and acting on the bills to further the political ambitions of Inslee, a presidential contender who is playing up Washington state’s programs in his bid. Traisman suggested Inslee’s previous attempts to line up Democratic lawmakers on climate-change measures had been thwarted by Big Oil. “What you’re seeing now is that they agree, and they’ve always agreed. There’s nothing new. This isn’t about, ‘Oh, let’s do one for the Gipper,’ ” he said. Rep. Doglio said Democratic lawmakers see a chance to make a positive example out of Washington state. “I think that there’s a recognition that the state has the ability to be the leader on climate,” she said. HB2042, which reinstates tax exemptions for electric vehicles and extends them to hydrogen-fueled cars while making permanent a state grant program to provide additional charging stations, among other changes. HB1112, which directs the state Ecology Department to issue rules phasing out refrigeration gasses that harm the climate. It has passed the House and Senate but now must be re-approved by the House to agree with changes made by the Senate. HB1444, which would set tighter energy-efficiency standards for computers, computer monitors, urinals and electric water heaters, among other provisions. Like the refrigeration gasses measure, it has passed both the House and Senate but now the House must concur with the Senate’s amendments before the bill can go to Inslee. Washington is rushing to complete a new set of standards for toxic chemicals before the EPA takes over and imposes its own standards on the state.